Here is an update from one of our teachers in Turkey! Read Regina Zafonte’s blog post below. Situated at the precipice of the Eastern and Western worlds, Turkey is a country where a multitude of cultures have collided, in some ways melding disparate elements and in others retaining distinct heritages. Nowhere is this more evident than the ancient and best preserved ruins of the once bustling port city Ephesus, nestled in a valley protected by steep mountains. The Turkish Cultural Foundation Fellows were brimming with anticipation at the historic treasures that lay ahead… and were not disappointed to see the vast layers of civilization. I was particularly struck by the imposing amphitheater built in 52ce, even before the famous Roman Coliseum. Perched among the high seats, I was imagining the entertaining shows and roaring throngs that occurred in this dome of history. On the path leading up to the amphitheater, you could find stones of gladiators with their pictures and lengthy biographies as a way to foreshadow the spectacular show ahead. Despite the sizzling temperatures and the scant amount of shady spots only to be occupied by Orhan, our humorous and informative tour guide, the heat did not wilt our enthusiasm in the slightest. We came across the Library of Celsius, one of the most beautiful of the restored buildings on the site. In the niches of the facade stood towering statues to symbolize wisdom, knowledge, intelligence and valor. In the front of the library, a piece of ancient graffiti of a faint menorah can be found that possibly represents the existence of a Jewish community. Although bathrooms are not usually the coveted attraction of sightseeing, I thought the men’s toilets, found along Curetes Street was a highlight because of the small seat sizes and the lack of barriers for privacy. It seemed to be that doing your business was also a place for socializing as men sat mere inches away from each other. Because the Romans are known as masters of moving water, it was no surprise that the site had an advanced water sewage system that took the water out of streets to keep the city pristine. As a port hub under the Romans, Ephesus attracted many influential Christian leaders, including Paul and became an important center in early Christianity. I thought it was interesting to learn how this vital presence of Christianity spilled over to other cities throughout Asia Minor. 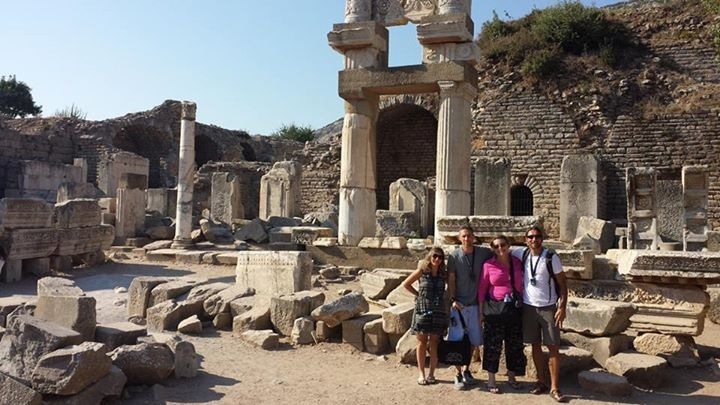 After having visited the site, I would agree that it is truly hard to comprehend the scale of Ephesus until you actually meandered throughout the century old roads lined with beautiful ionic and Corinthian columns. I feel so fortunate that the Turkish Cultural Foundation and the World Affairs Council of Connecticut made this once-in-a-lifetime experience come true. This is absolutely a site for every world history teacher! Previous Post A Burst of Turkish Delight!